Star Trek in my mind has always been best suited for the episodic television format it was created for. However, Hollywood being Hollywood, there is no way that could be left alone. Oh no! Instead, Star Trek has found its way onto the big screen no less than 12 times, with lucky number 13 on the way in July. 6 of these movies were with the original TOS cast, 4 were with the TNG crew, and of course the last 2 are the JJ Abrams reboot of the franchise. With this much material, it is only natural that we have something of a mixed bag; some of these movies are great, some are so-so, and some are quite bad. So, without further ado, here is my list, starting from worst to best! Ugh. Where to begin? The bizarre plot of this Shatner-directed movie involves a half-brother of Spock’s that we have never met before, who manages to co-opt the Enterprise into doing something physically impossible; flying to the center of the galaxy! In between, we are treated to such bizarre set-pieces as Spock using anti-grav boots to pull off an impossible rescue of Kirk as he falls off a mountain, the (in)famous Uhura fan dance, and a scene in a turbolift shaft where Kirk, Spock, and McCoy zoom past Deck 78 (on a ship that is supposed to only have something like 21!) using the afore-mentioned anti-grav boots. It’s not all bad, I suppose…if Shatner nailed one thing with this one, it’s the interactions between the crew. There are some classic moments for most of the cast in this one, and it doesn’t seem like anyone did anything too out of character. It’s just a shame that the situations they were put in were so no-sensical! The third TNG film largely got a “meh” from me. I would say I probably have seen this one the least of all the Trek films. I think the biggest problem is that the plot for this move would have made a perfectly adequate episode of TNG. However, once you stretch it to movie-length, it gets a bit thin. I liked the joystick-controls for the Enterprise, that was pretty neat. It was also fun to see a return of baby-faced Riker. It was a bit lame that the Enterprise E, supposedly of the combat-oriented Soverign class, was no match for the Son’a ships. The new Star Trek movies have been widely acclaimed by many, and generally seem to be well liked. And to be fair, I enjoy them quite a bit. However, my position on these movies is that while they may be great movies, they aren’t overly great at being Star Trek movies. They are much more action-oriented than any of the movies or TV shows that came before, and seem to have chosen flash over substance when it comes to the ship and tech designs. The second movie, Into Darkness, also made what I consider a mistake by ripping off so many elements from TWOK. Instead of feeling like an homage, it felt like lazy writing. Probably the best aspect of these movies is the cast; the new version of the TOS crew feels “just right,” and definitely have a lot of the chemistry that made watching the original crew so much fun. The first TNG movie was something I remember looking forward to with great anticipation. I mean, Kirk and Picard together on screen?! 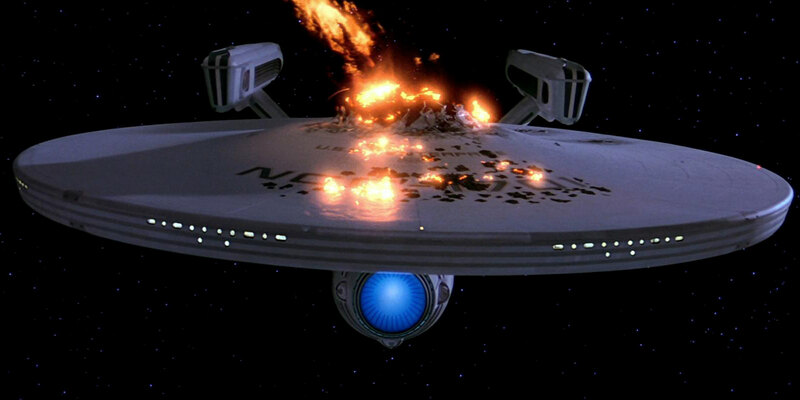 However, this one ended up as a bit of a disappointment; the Nexus never felt right as a plot device, Kirk’s death scene fell flat for me (falling down a canyon vice a blaze of glory), and they blew up the Enterprise-D! A solid movie, but not the best by a long shot. Save the Whales! This has perhaps the most overt message of any of the Trek movies, having been released at a time when environmental conciousness was starting to become main steam. I always thought this movie was fun, even a little wacky (Nuclear Wessels, anyone? ), though watching it today feels like watching a 1980’s time capsule instead of a Star Trek movie! Lots of logic leaps in this one; the whole concept of how the Genesis device works is on shaky scientific ground to begin with, and wrapping up the rebirth of Spock into it was a bit much. Thanks to the bleak opening of the movie, the destruction of the Enterprise, and the death of Kirk’s son, much of the movie has melancholy feel to it that the resurrection of Spock doesn’t quite counter-balance. Still, it was neat to see two more Federation ship designs, the Oberth and Excelsior. Plus, Christopher Lloyd makes an excellent Klingon! I generally liked this one, and I think it’s the second best of the TNG movies. It had some great set pieces, like the buggy race on the desert planet, and the battle between the Enterprise E and Scimitar at the end of the movie. Still, I was a bit disappointed by some aspects of this one. The Picard-Shinzon angle just didn’t work for me; it didn’t carry the emotional impact I think it was supposed to. Nor did Data’s sacrifice at the end. It felt like it was a rip-off of Star Trek II, though not as bad as Into Darkness did. This movie is often described as the “Slow-Motion Picture,” but I have to say, growing up I absolutely LOVED this one. The extended dry dock tour of the newly refitted Enterprise is one of my favorite sequences in all of Star Trek. The refit Constitution class is easily my favorite starship design, no doubt due in part to the dramatic introduction it received in this movie. On top of that, Jerry Goldsmith’s score is so excellent that it will go down in history as synonymous with Star Trek. Like Insurrection, though, I think TMP suffers from a plot that, while adequate for an episode of the TV series, is just a bit thin for a movie. This was the last of the TOS movies, and I have to say that Kirk & Company went out with a bang! A fun mystery story at heart, the movie is fleshed out with some great space combat, political intrigue, and some decent humerus moments. I think the tone of this movie comes close to matching that of TWOK, which makes sense as the same director did both (Nicolas Meyer). There are some oddities in this one that make me scratch my head, however. First is the fact that several scenes had to use sets that had already been converted for use in TNG, such as the observation lounge and engineering. These just don’t match with the refit Constitution’s layout. Plus, why on earth is there military barracks-style open berthing on the Enterprise? For the given crew size, there should be plenty of space for everyone to have a room to themselves! Still a great movie though. I think this is easily the best of the 4 TNG movies. There are lots of aspects to like. For example, it has the Borg, which is great for the added sense of dread they bring to the movie. It has a brand-new Enterprise, the Soverign-class Enterprise-E. And it is neat to have an account of how humanity took it’s first steps towards becoming a member of the wider galactic community. About the only issue I could find with the movie is that it does not feature as much character interaction as I would like. Much of the screen time is given over to Picard’s interactions with Lily, a character that was there and gone just for the movie. I would have preferred to have one of Picard’s other close companions in her place, like Riker or Crusher. Still, this is all-around a great move, helped out by a great score from Jerry Goldsmith. KHAAAAAAN! This is not just my favorite Star Trek movie, it is my favorite movie period. There is so much to love about this movie; the tense standoff between Kirk and Khan, the explosive space combat, and the tense cat-and-mouse game in the Mutara Nebula at the end make for plenty of action. However, this movie also probably had the biggest emotional impact of any of the Trek films. The sub-plots of Kirk dealing with aging and his almost-family are dealt with nicely, but it’s the death of Spock at the end of the movie that is the big one. The scene where Kirk rushes to engineering to find that Spock had heroically sacrificed himself to save the Enterprise chokes me up every time. Lots of other things to like about this movie; The James Horner theme is excellent, easily the second best theme in all of Trek after the Goldsmith theme. We got to see a Federation starship other than the Constitution class for the first time on screen, with the Miranda-class USS Reliant. For all of those reasons, TWOK makes it to the top of my list. That’s it for now! Live Long and Prosper. This entry was posted in Sci Fi and tagged Star Trek. Bookmark the permalink.